Automatically record, transcribe, and organize your cell phone calls so you can remember every conversation. Keep track of who you talked to and what you talked about. Let Productive capture every word and sentiment so you can focus on the call, not writing notes. Type or voice-record key points and action items after calls. No need for a separate notepad. Call history, recordings, transcripts, and notes are catalogued by contact so you can find what you need easily. Works on both incoming and outgoing calls. No second number needed. Your calls are seamlessly routed through our platform so you don't have to merge calls or get a second number. Record and transcribe any call with the tap of a button. Or set Productive to capture all calls automatically. Recordings and transcripts show up in the contact's history screen for easy reference and export. Let Productive handle the details so you can focus on the call. Close more deals by focusing on questions and objections, not scribbling notes. Remember key details and share insights with your team. Review calls to improve sales tactics. CRM integration coming soon! Stay on top of back-to-back calls with companies, investors, or partners. Preserve critical conversations and agreements. You can also record conference calls by dialing in with Productive. Focus on active listening and asking questions during every user interview while knowing every quote and reaction is being captured and easily accessible afterwards. Use Productive for phone screenings and reference calls. Share recordings and transcripts with stakeholders so you can collaborate effectively on hiring decisions. Capture internal discussions and share recordings and transcripts with team members who couldn't dial in. Keep track of every idea, decision, and action item and keep everyone in the loop. If you work in financial services, customer support, or other functions where your mobile calls need to be recorded to meet record-keeping standards, send us an email and we can help! Does this work with my current phone number? Yes. Callers will reach you on the same number you've always used. Do I need to get a second number? No. You don't need to buy or give out a new number to your contacts. Does this work for both inbound and outbound calls? Yes, Productive can capture any incoming call you receive on your regular mobile number as well as outgoing calls you make using the app. Productive uses your wireless carrier's phone service when you make or receive calls so you get the same high call quality as your regular mobile calls. Downloading and setting up the app takes just a few minutes. The app will walk you through the setup steps. How do I record/transcribe my calls with Productive? Productive can record/transcribe any incoming call, as well as outgoing calls made through the app. Calls are automatically routed through our server, so you don't have to fumble around with call merging. All you have to do is open the Productive app during your call and hit the big red "Record" button. You can also choose to automatically record/transcribe all incoming and outgoing calls in the app settings. How does Productive work on incoming calls? If you set up Productive on your incoming calls, they are seamlessly forwarded to our server where they can be recorded and transcribed. Can I still use my phone's native calling app? Yes, but you cannot record or transcribe calls made through your native calling app. Can I choose which calls to record/transcribe? Yes. You have complete control over which calls you want to capture, and can choose to turn recording on/off at any time during your call. You can also choose to automatically record/transcribe all incoming and outgoing calls in the app settings. How much does Productive cost? The app is completely free to use during our beta! Do you integrate with other apps? 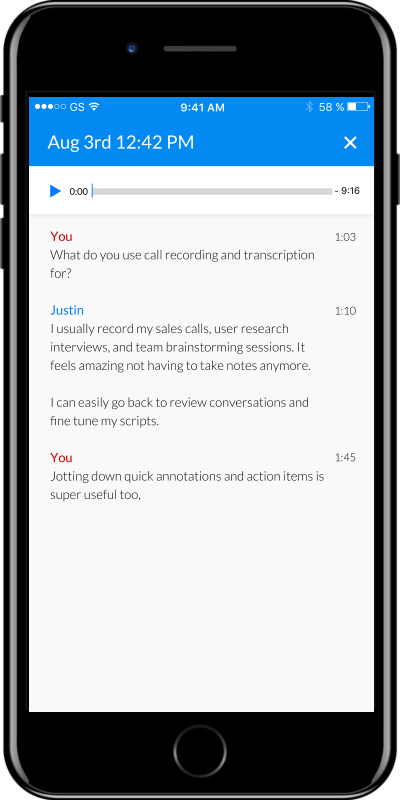 We're currently building 3rd party app integrations to let you share the recordings, transcripts, notes, and call logs you choose. If you would like to suggest an application you want to export your notes to, drop us a note at [email protected] to help us prioritize! What phones do you currently support? The app is currently available for iOS 11 or later, but Android support is coming soon! How do I increase the playback volume for call recordings? To increase the volume of your iPhone past the default maximum, go to your iPhone's Settings app. There, set Music -> EQ -> Late Night. Yes. Call recording is already widely used by businesses for conversation reference, customer service quality assurance, and legal compliance. Recording is Federally legal (18 U.S.C. § 2511(2)(d)) with the consent of at least one party (you). In addition to this Federal statute, 38 states and the District of Columbia have adopted this "one-party" consent requirement. The rest of the states require two-party consent, which means everyone on the call must consent to the call being recorded. You can review your state's recording laws here. How does Productive keep me compliant? 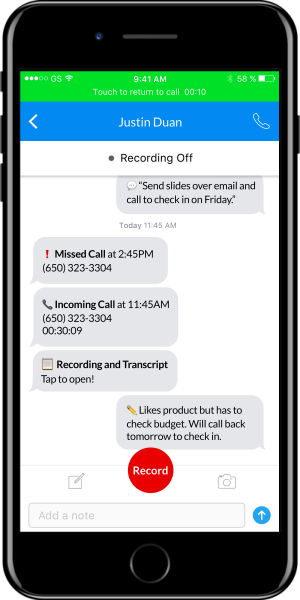 For incoming calls, Productive plays a greeting message to inform callers that calls may be recorded or transcribed - similar to what businesses do today. In our experience, most users prefer using the recording announcement so they don't need to request permission themselves. However, you can disable it in your app's settings if you would like to ask for permission yourself or if your local laws only require one party consent. We recommend you leave the announcement message on but if you choose not to, simply obtain permission beforehand to be safe and polite. You can just ask, “Is it okay if I record this call so I don’t miss anything you’re saying?" You can turn recording on and off at any time during the call. For outgoing calls, Productive doesn't record by default. You can turn on recording during the call after you ask for consent or if your local laws do not require two party consent. You can also turn on automatic recording of outbound calls in your settings. The security of our users' data is our highest priority. Your recordings and transcripts are transmitted and stored anonymously in databases with industry-standard encryption. Will my recordings be kept private? Yes. Our users' privacy is of utmost importance. With the exception of only the technology providers necessary to perform our service, no other 3rd parties will be provided access to your private data. Which countries do you currently support? We currently support users with U.S. cell phone number, but other countries are coming soon. Which carriers do you currently support? We currently support users on AT&T, Verizon, Sprint, and T-Mobile. How do I turn off / on Productive on my incoming calls? To turn off call forwarding to our server, search for the "Productive Call De-activation" contact in your phone's native address book and call the number. To turn on call forwarding to our server, search for the "Productive Call Activation" contact in your phone's native address book and call the number. COPYRIGHT © 2017 PHONEIC, INC. ALL RIGHTS RESERVED.